With the return of volatility in the equity markets this week, we provide some historical context and thoughts on the state of the markets and economy. As the national media has been sure to point out, the 1175 points the Dow Jones Industrial Average fell on Monday was the single largest point drop in the history of that index. But according to research by The Reformed Broker (http://thereformedbroker.com/2018/02/05/dow-drawdowns/), the 4.6% the Dow fell on Monday was just the 108th worst day in percentage terms. Still nothing to take lightly, and the last time we had a day like that was in 2011, but it wasn’t even a ‘top 100’ bad day. As the market gets higher in point value the greater a movement by an equal magnitude of percentage will appear. In fact, the action of the past week has been closer to ‘normal’ market behavior in the historical sense than have the last 18 months of historically low market volatility. Before the decline on Jan. 31st, the S&P 500 hadn’t fallen more than 1% in 112 consecutive days, the longest such streak since 1985. That day also marked the first consecutive 0.5% loss in 310 days; an all-time record. 2017 was also the only year in history where every calendar month saw a gain in the S&P 500 on a total return basis. The market action of 2017 was exceptionally, historically quiet. In behavioral finance, one of the most common and difficult biases to overcome is that of recency. Our brains are wired to expect the most recent experience to be the normal experience. It was true after the turmoil of 2008, when the fear of 50% market declines kept many retail investors out of the market for years, and it is true now, when our experience of incredibly low volatility in 2017 appeared to be the norm. Let’s examine some historical context. Over the last 38 years (1980 – 1Q2018), the average intra year decline has been 13.9%. If you only count the years where the index finished up double digits for the year, the average decline in those years is still 10.7%. Many of our clients have seen this chart before. It is a powerful reminder that equity investing is often a volatile activity. 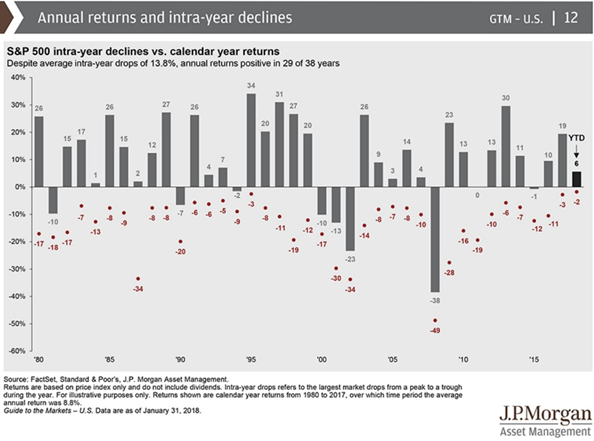 The red dots and numbers indicate the intra-year declines, demonstrating that double digit declines in any given year should happen. 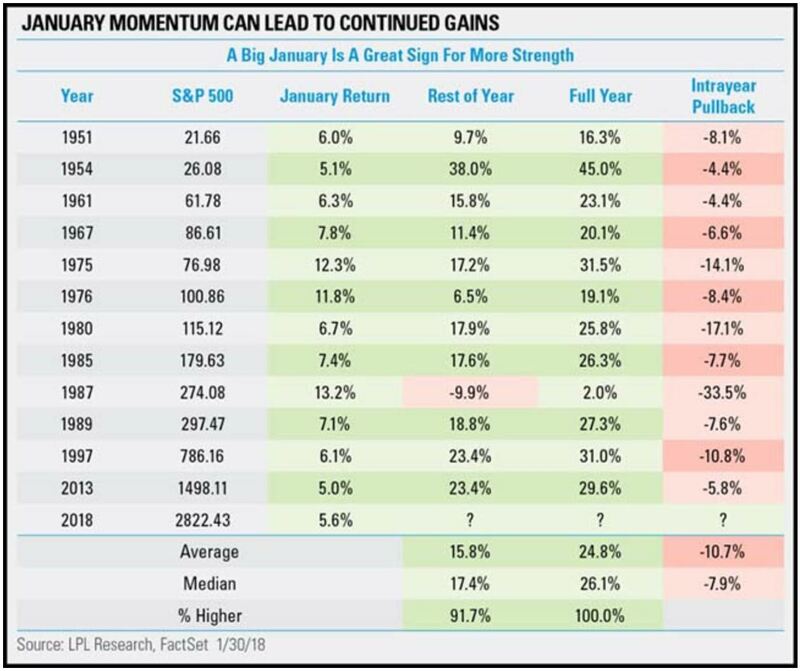 The good news is that strong January’s typically signal strong years. But even in those large double digit gaining years, many of them also had large intra-year declines. Even 1987, which is known for the single day on which the Dow shed more than 22%, is much less known for being a year that investors actually finished up 2%. This is to say plainly that double digit intra-year declines in the equity markets are a healthy and necessary part of the price discovery process. However, as much as the historical comparisons can be helpful in providing a solid frame of reference, it is also important to remember that every situation is unique, and the precise set of circumstances are different every time one of these declines occur. This past week the circumstances were such that company executives were beginning to mention inflationary pressures on earnings calls, a new Federal Reserve chair was set to be sworn in, and rates are climbing with the potential for a further acceleration of hikes this year under the new leadership. Couple this with the fact that the S&P 500 had just jumped 6% out of the gate in January after a year of a 20+% return and the context for selling pressure is evident. One market dynamic that is at play now, more so than at any other time in history, is the systematic nature of the order flow in the modern market. Algorithmic trading, volatility-based strategies, trend following funds, and others that make use of automatically triggered, computer generated orders have changed the way that markets function. Many of these effects are positive, including increased liquidity; but when you combine these newer methodologies and the technology that powers them with the more familiar mechanism of sell stop orders set below a rising market, you have the conditions necessary for what we saw on Monday afternoon, when the Dow fell more than 800 points in 10 minutes. We strongly believe that the primary intermediate and long-term drivers of the markets are fundamental, and it is easy to forget after the events of the last few days that we are in the middle of what is shaping up to be a pretty stellar earnings season. With about half of S&P 500 companies having reported results, fourth quarter earnings are tracking to a 13.6% year-over-year increase. A solid 78% of S&P 500 companies have beaten consensus earnings estimates for the quarter, which is above long-term averages. Growth has been particularly strong in the energy, financials, and technology sectors. Perhaps most impressive is the revenue upside, with 80% of companies beating consensus forecasts, well above recent and long-term averages in the 50’s. Additionally, the global manufacturing numbers are showing an almost unprecedented level of coordinated global expansion. Real risks to these narratives are rising rates and inflation, but at this point both debt and equity capital are still easy for companies to attain. 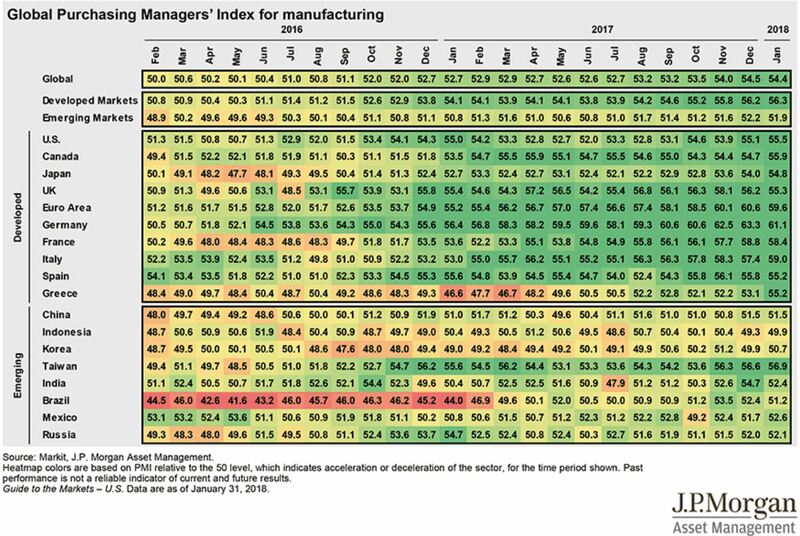 This is a chart depicting the global manufacturing index. Numbers above 50 indicate expansion, below 50 signal contraction. Far right hand side was January 2018. We are seeing an incredible upswing in production in almost every developed economy in the world. Our position has always been that these types of corrections, while violent when amid them, are normal parts of equity investing and cannot be timed with accuracy over the long-term. We will remain focused on economic fundamentals and invest over a time horizon measured in years and decades. Investment advice offered through Private Advisor Group, a registered investment advisor. Private Advisor Group and The Philadelphia Group are separate entities from LPL Financial.